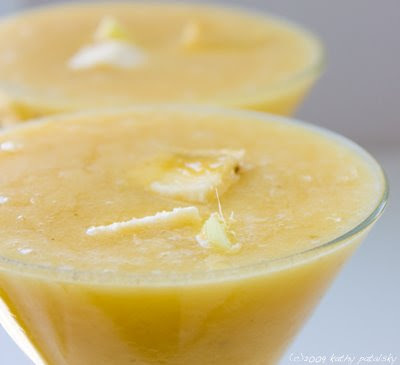 Fresh Ginger Raw Banana Smoothie. Frothy Zing. There is a myth that when using ginger in a juice or smoothie you must first juice (extract juice from) the ginger chunk and then add it to your juice or smoothie. Not true. You can actually peel and roughly chop fresh ginger and add it whole to a smoothie blend. The blender will do the work for you. 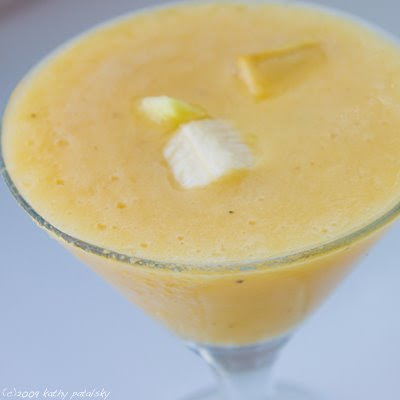 It's fast and easy and adds that zing-licious ginger flavor to your smoothie. 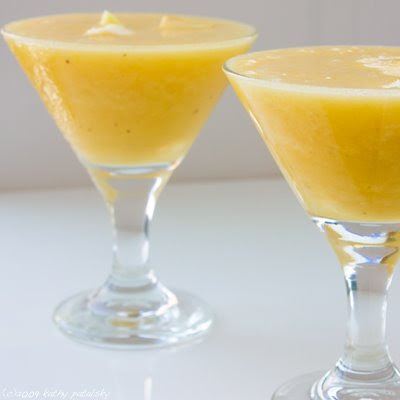 Here is my recipe...the drink of the day! * Juicy ginger pieces work better than dry grainy ones. Blend all ingredients, but only half the portion of ice cubes, on high. As smoothie becomes blendable and thin, ad in the remaining ice cubes. You must use coconut water or juice ice cubes. Otherwise the high amount of ice will water down the flavor. When using a raw, unfrozen banana in a smoothie you must use a lot of ice. Otherwise your smoothie will become mushy. My favorite juice in this smoothie would be a fresh juiced OJ/Mango blend. Super fresh flavors.